Security guards play a vital role in the day-to-day operation of businesses. Personnel in this role are trusted by their employer to maintain peace and order and to keep the premises safe. Before hiring a security guard, employers should expect them to have the following five essential skills. According to the Security Industry Authority, security personnel have to undergo a training programme that results in a recognised certification and licence. This gives them the necessary skills and knowledge to do their job competently and in turn build an attractive CV. Furthermore, knowledge of first aid and CPR is essential, as it not only increases public safety but shows the security guard’s dedication to their job. In short, the more experience, the better. Individuals with experience working in the police or armed forces are usually strong candidates. 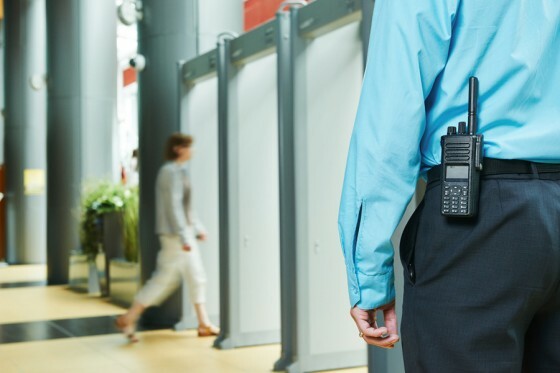 Security guards must be able to communicate effectively with their supervisors and co-workers, as well as the general public. This means having the ability to recall events verbally and produce written reports of their experiences in order to maintain the safety of people and property. In most cases, effective communication is the best way to handle and resolve conflict. A certain level of physical fitness is usually required of security guards, as the role demands standing or walking for prolonged periods of time and defending themselves and the public when necessary. In some instances, they may have to chase and subdue a suspected criminal. Without a healthy and physically fit guard, the security of a business could be compromised. Another essential skill for security guards, according to the National Careers Service, is the ability to use their initiative and make quick decisions in emergency situations. They should know exactly how and when to act, especially if the situation puts a fellow employee or customer at risk. This is an important quality that factors into every part of the job, from simply interacting with the public to anticipating a threat. As security guards often work independently, it is all the more important for them to make the right decision and take responsibility for their actions. CCTV plays a big role in the security of a business, but guards are still the most effective method. They must have a good eye for detail, be attentive to their surroundings at all times and be able to detect imminent threats. Memory also plays an important part in this process, as remembering tiny details like facial features can help detect and prevent criminal behaviour. Looking for security guards in Gloucester or Cheltenham? Ask Cuffgroup for more information about security services in your area. Hiring a professional security guard can be risky for any employer, particularly when they can only base their decision on a CV and brief interview. However, if you can demonstrate your knowledge of the field and possess these five essential skills, you’re clearly an experienced individual and the best candidate for employment.